Banjo is a handsome red brindle male, twenty four months old, three feet tall, hazel brown eyes with a smile like the sunrise. Banjo is a retired racing greyhound. He has graduated from the Greyhound Advancement Center greyhound and inmate prison training program at Hardee Correctional Institution. 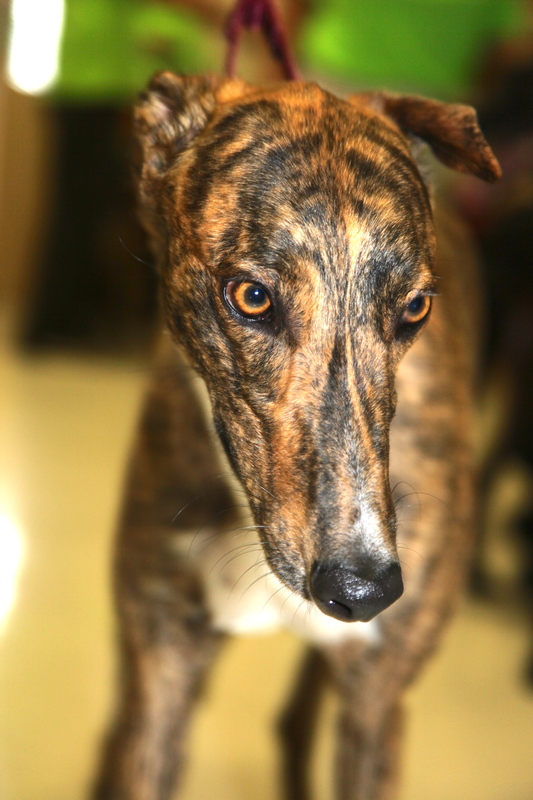 Banjo has a gentle, easy going spirit that will quickly win kids and adults over with his love. He enjoys rubs and quality time with those who want to love on a hound. He is inquisitive, smart, fast and enjoys lots of fun in the sun. Banjo also enjoys occasional power naps. So if you’re not afraid to have fun and want a quality pup in your life, feel free to look this greyhound up! Banjo will make a great companion for years to come. Banjo is available to move into his forever home. Sponsored by Bay Area Greyhound Adoptions.